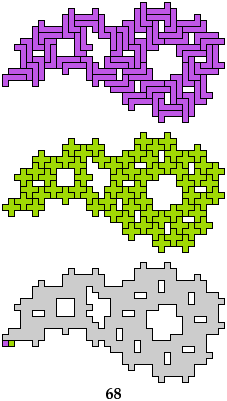 One figure can be tiled with one pentomino, and another figure can be tiled with another pentomino. The figures differ in only one cell. How near can the unmatched cells lie? If you find a smaller solution for any of these pairs, please let me know. 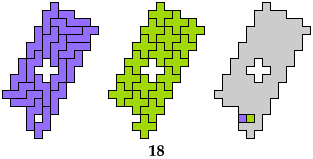 Green cells denote shifts of three units. Orange cells denote shifts of five units. Back to Polyform Cell Shifting < Polyform Compatibility < Polyform Curiosities.